As the widest ski in Scott's all-mountain Slight lineup, the Slight 100 can aptly handle any condition you point it towards. 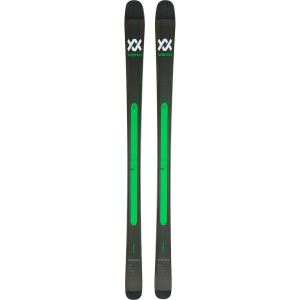 The rockered tip provides an easy maneuverability and increased stability in deep snow, while the camber underfoot reliably grips firm groomers as you compress into and release out of your turns. Thanks to a poppy, playful wood core, the Slight feels impressively lightweight, with carbon and fiberglass around the core to give the ski stiffness and power. Scott also utilized Aramid stringers in the construction of the ski, adding extra strength and stability without weighing it down.